Vinegar is the product of a two-step fermentation process. First, sugars are converted to alcohol by natural yeasts. Red and white wine vinegars use grapes to make alcohol, cider vinegar uses apples, but any fruit can be used to create the alcohol base. A secondary fermentation uses natural acetobacter culture to convert the alcohol into acetic acid, the essential component of vinegar. This is a slow process, often taking between six months and a year. In the end, no sugar or alcohol remains, but the colour and flavour of the fruit are preserved. What makes Salt Spring Artisan Vinegar special? 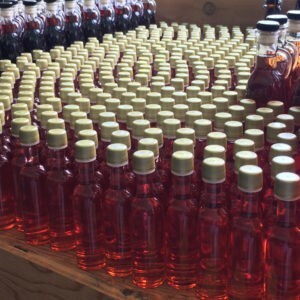 Most of the fruit vinegars available in stores are the product of infusion. This means the makers of those products are buying ready-made wine vinegars and infusing them with fruit flavour. In most cases they are also adding sugar and sometimes artificial flavouring. We never use bought vinegar in our products. We make everything one hundred percent from scratch. Our raspberry vinegar, for example, is not simply white wine vinegar that had some raspberries soaking in it for a while, it is actually made directly from the fruit…it is true raspberry essence, no sugar or artificial flavours added. We grow some of the fruit ourselves including plums, blackberries, apples, pears, rosehips. What we can’t grow we try to source first from Salt Spring Island farmers (strawberries, figs, currants, cherries, some grapes) and for things that we can’t find on our island we select the best that the rest of British Columbia has to offer (peaches, raspberries, wine grapes, blueberries). 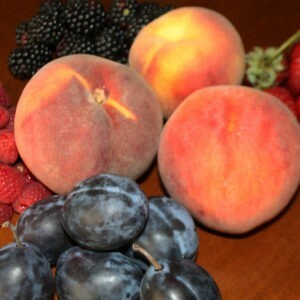 We are also very committed to organic agriculture and buy certified organic fruit whenever possible. 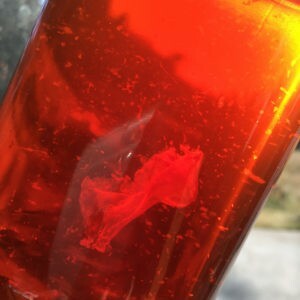 What is “mother” (the little jellyfish floating in my bottle)? Our vinegar is raw and unpasteurized. This means that the acetobacter culture that creates our product is still alive inside our vinegars. Healthy acetobacter colonies produce a natural cellulose byproduct that is often called “mother of vinegar”. Over time you may begin to see mother forming in your bottle of vinegar, looking something like a tiny jellyfish floating around. This is a completely natural and harmless result of living vinegar, and is NOT a sign that something is wrong with your vinegar! The mother is safe to consume, but if it’s appearance starts to bother you, you may simply strain it out. How long does this vinegar last? Lucky for us, vinegar doesn’t go off! In fact, it often improves with time, mellowing like a fine wine. Time (and exposure to oxygen) may result in the formation of “mother”, but as explained above this isn’t such a bad thing! So don’t worry if you find an old bottle in the back of your cupboard, it’s probably even better now than the day you bought it! Bree Eagle moved to Salt Spring Island when she was five years old. 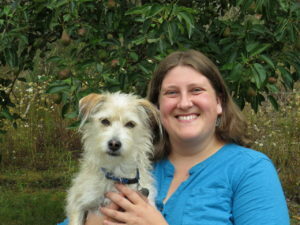 Her parents ran a ten acre, certified organic farm and she spent her childhood learning to grow fruits and vegetables. She loved the apple orchard most of all including the young trees her parents planted and the 100 year old giants planted generations before. As the farm and orchard grew, Bree learned to preserve their abundance…canning, freezing, drying, and most of all…fermenting! Apple juice turned to hard cider and cider eventually to cider vinegar. And thus, a business was born. Now Bree focuses all of her time on the art of fermentation, harvesting island grown fruits and herbs to use for her vinegars, staying connected to her agricultural roots. Though she no longer lives on her parent’s farm, that land will always be a part of who she is. 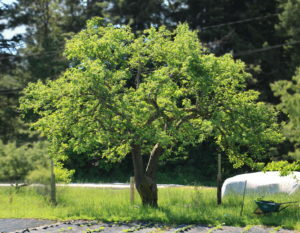 The beautiful apple tree in our logo is one of the heritage trees that still grow there. A Laxton Superb, planted in the early 1900’s, it is a piece of the past, rooted in traditions and still growing strong.